Reprint. "An Allen Lane book"--Back cover. Originally published: London: Allen Lane, 2016. 'A breeze of a read, makes you see our male-manufactured world a little differently' Matt Haig'GRAYSON PERRY FOR KING AND QUEEN OF ENGLAND. Imagine how BRILLIANT our country would look if he was' Caitlin MoranGrayson Perry has been thinking about masculinity - what it is, how it operates, why little boys are thought to be made of slugs and snails - since he was a boy. 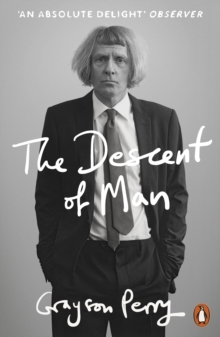 Now, in this funny and necessary book, he turns round to look at men with a clear eye and ask, what sort of men would make the world a better place, for everyone?What would happen if we rethought the old, macho, outdated version of manhood, and embraced a different idea of what makes a man? Apart from giving up the coronary-inducing stress of always being 'right' and the vast new wardrobe options, the real benefit might be that a newly fitted masculinity will allow men to have better relationships - and that's happiness, right?Grayson Perry admits he's not immune from the stereotypes himself - as the psychoanalysts say, 'if you spot it, you've got it' - and his thoughts on everything from power to physical appearance, from emotions to a brand new Manifesto for Men, are shot through with honesty, tenderness and the belief that, for everyone to benefit, upgrading masculinity has to be something men decide to do themselves.